These stamps (Mi-Nr. 30, Scott No. 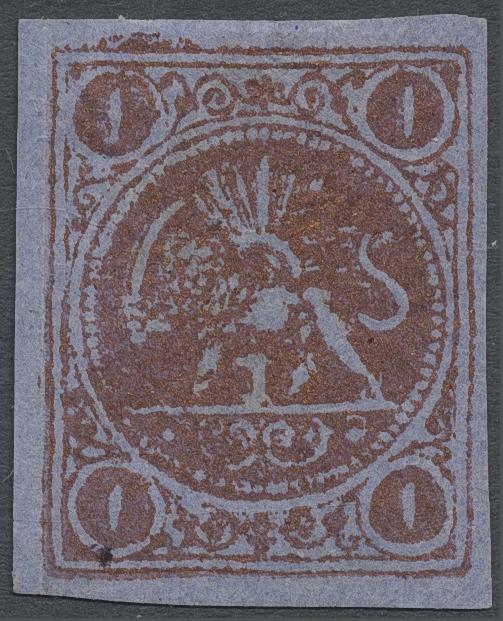 40) in mint condition are very rare and seldom offered, however, the shown stamp was now offered at leased twice at auction recently. And in Gärtner’s 15. Auction from 7.-10. September 2010, Lot No. 2514, Estimate Euro 35000 but unsold again. And in Gärtner’s 16. Auction from 22.-25. November 2010, Lot No. 2308, Estimate Euro 35000 but unsold again. The stamp is now offered at David Feldman, Switzerland, 19-21. May 2011, Lot No. 20505, Minimum Bid Euro 20000. Update, the stamp has now been sold at Feldman for a hammer price of Euro 22000 plus fees.